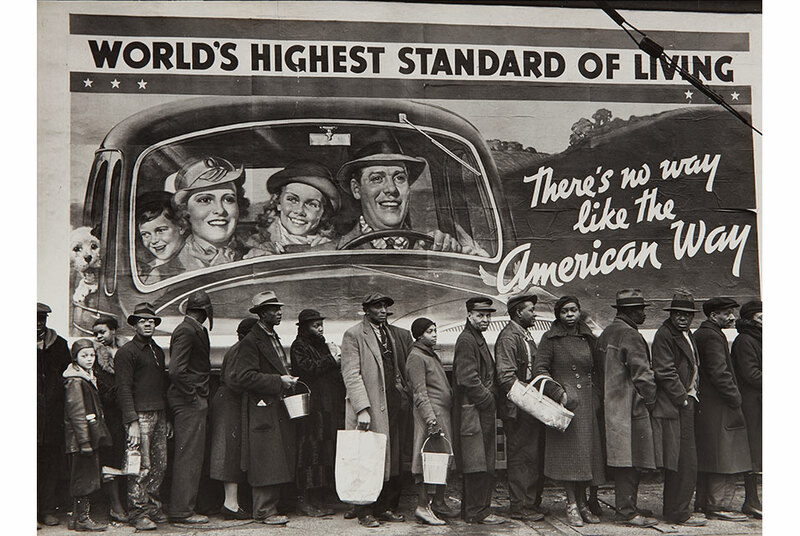 Margaret Bourke-White, Flood Refugees, Louisville, Kentucky, 1937. Estimate: $150,000-250,000. Image courtesy of Phillips. NEW YORK, NY.- Phillips announced the sale of Passion & Humanity: The Susie Tompkins Buell Collection, an auction of 58 lots taking place on 4 April at 5pm EDT, following the seasonal April Photographs sale. Encapsulating two major photographic themes of the first half of the 20th century  Modernism and humanism  the collection includes many influential female photographers, not only Modotti, Lange and Bourke-White, but also Imogen Cunningham, Consuelo Kanaga, and Alma Lavenson, among others. The sale brings together a selection of masterworks by Edward Weston and Tina Modotti whose love affair in Mexico in the 1920s sparked a period of exceptional creative output for both photographers. Westons evolution as a Modernist began during this time. Circus Tent, 1924, estimated at $400,000-600,000, shows the abandonment of his earlier Pictorialist style in favor of a growing interest in formalism, evident in the abstracted subject and the extreme angle from which it was taken. In Palm Trunk, Cuernavaca, 1925, estimate $400,000-600,000, this exploration of perspective is taken even further as Weston fully isolates the towering palm trunk against the sky. Modottis exceptional Telephone Wires, also taken in 1925 and estimated at $250,000-350,000, is the ultimate Modernist composition of vertical and horizontal line and demonstrates the extent to which she and Weston approached different subjects with a similar aesthetic, each to their own unique success. Her sublime Roses, Mexico, 1925, offered at $300,000-500,000, shows her mastery of the photographic still-life. Ms. Buell made market history when she purchased this print at auction in 1991 for $165,000, setting a new price record not only for Modotti but for a photograph at auction. ln Campesinos, 1926, estimate $150,000-250,000, Modottis synthesis of the Modernist preoccupation with shape and form and her burgeoning interest in the plight of the Mexican workers is fully realized. Here, Modernism becomes the visual language of her political activism, a central theme that is evident throughout much of her work. Cementing their storied and complex relationship are portraits of each taken by the other: Westons frontal and intimate portrait Tina Modotti, 1921, estimate $200,000-300,000 and Modottis Edward Weston with Camera, circa 1924, estimated at $25,000-35,000. Taken just before the outbreak of World War I, Edward Steichens Heavy Roses, Voulangis, France, 1914, is one of photographers most celebrated works and will be offered at $400,000-600,000. This breathtaking palladium print, incorporating Steichens masterful use of solarization, imbues the roses with the weight of the impending conflict. Dorothea Lange and Consuela Kanaga are two photographers with significant representation throughout the collection. Exquisite prints of Langes White Angel Breadline, 1933, estimated at $100,000-150,000, and Migrant Mother, Nipomo, California, 1936, estimated at $100,000-150,000 will be offered alongside Farm Security Administration images from across the country, highlighting the breadth of her work and the sympathetic manner with which she captured the devastation and struggle of a generation. A Sign of the TimesMended Stockings, Stenographer, San Francisco, 1934, estimated at $60,000-80,000, an image of a womans heavily torn but carefully repaired stockings, embodies a central theme of the collection: the perseverance of womenand by extension the human spiritin the face of hardship. Kanagas moving portraits of African-Americans, such as Profile of a Young Girl, from the Tennessee Series, 1948, estimate $15,000-25,000, present her subjects as individuals, outside the context of class or racial disparity. Other highlights include Imogen Cunninghams Calla, 1920, estimated at $250,000-350,000; Margaret Bourke-Whites Flood Refugees, Louisville, Kentucky, 1937, estimated at $150,000-250,000; and Alma Lavensons Glass Study, 1931, estimated at $20,000-30,000. While primarily known for co-founding Esprit and The North Face, as well as for her political activism and philanthropy, Susie Tompkins Buell has played an equally large role in the photography market. Ms. Buell developed a reputation as a market maker at a crucial time in the photography world, when the medium was just beginning to come into its own, and evolve from a collectible into a mature and fully-formed feature of the fine-art market. Susie Tompkins Buells early engagement with the medium in the 1980s and 1990s shaped the market in the decades that followed and brought a new awareness to photography. The proceeds from the sale of these photographs will benefit charitable causes.